The 2016 membership renewals have just been sent to each of your member companies. We are grateful for our member companies and the men and women we serve every day at PESA. As we prepare for 2016, we would like to learn more about your experience with PESA and how we might serve you best in the coming year. Please take a few minutes to complete our short survey. As a member, you understand the strong value proposition of PESA. 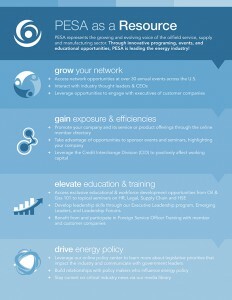 As you encourage others to join us, please share the graphic below that outlines the benefits of PESA membership.